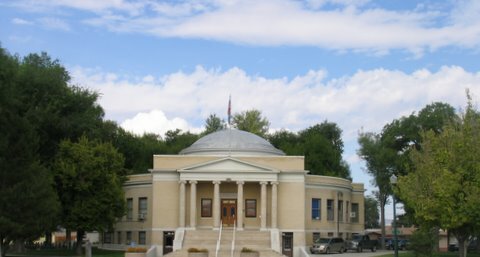 This courthouse is said to be one of just two round halls of justice in the USA. Clouds fill the sky in the domed ceiling above the round courtroom. 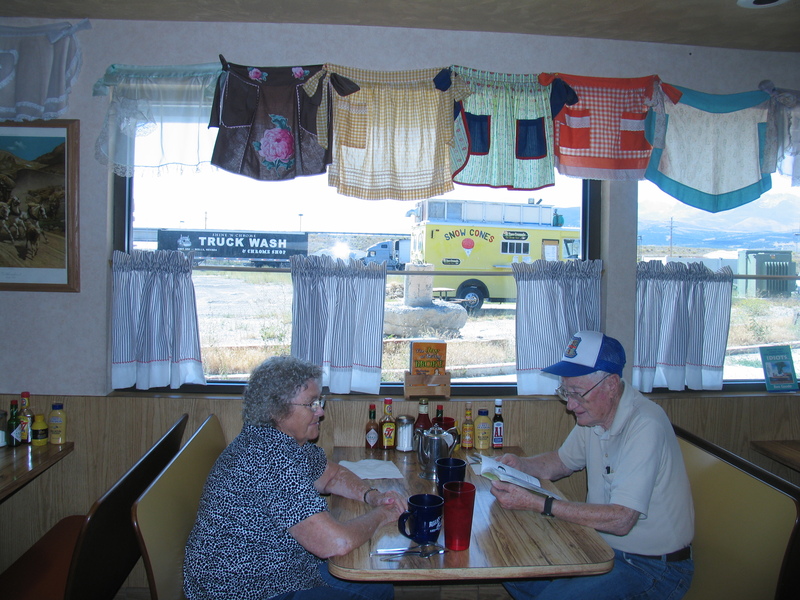 Between Winnemucca and Sparks (a town joined to Reno by urban sprawl), the greatest excitement is in Lovelock, a town lying in a meadow valley bounded by three mountain ranges. It was here that pioneers heading west stopped to rest and graze their animals before crossing a dreaded 40-mile desert and the Sierras to reach California and Oregon. A modern traveler will find that Lovelock now has three very different claims to fame. First is its courthouse, said to be one of only two round courthouses in the country. 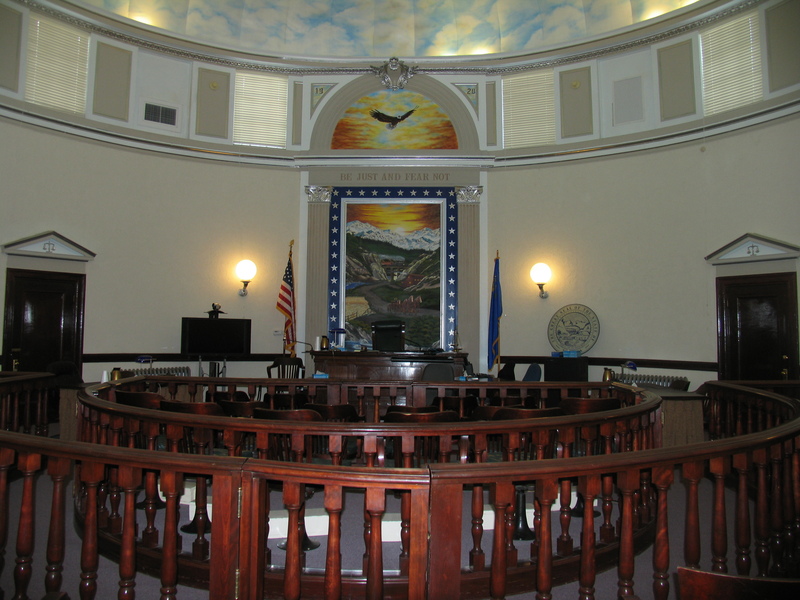 Since 1919, when Lovelock became the seat of Pershing County, justice has been meted out here. But when my husband and I visited, there was no one in the building to ask whether a court in the round is any more just than a square or rectangular court. A multitude of locks has been left behind by romantic visitors. The second attraction is a small park right behind the courthouse. 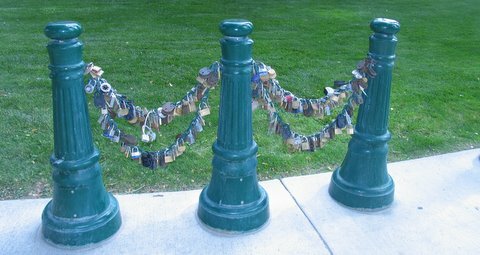 In 1868, the coming of the Central Pacific Railroad brought a large Chinese population to the town, and it is here, in Lovers Lock Plaza, that the town preserves a Chinese custom of symbolically “locking one’s love” on a never-ending chain. Accordingly, lovers bring a lock (or buy one in the town) and make eternal their declaration of love by attaching the lock to one of the chains strung between metal poles behind the courthouse. A quick look at the locks reveals that many bear a “Lovelock” stamp, which suggests that this “ancient Chinese custom” is very good for local business. The town’s name, however, has nothing to do with love and locks, but derives, instead, from the surname of merchant, rancher, and prospector George Lovelock. The town’s third claim to fame―or infamy―is that O.J. Simpson, who did not know how to love or live, has been locked up since 2008 in the Lovelock Correctional Center, where he is serving a 33-year sentence (with possibility of parole after nine years) for his part in an armed robbery. The judge in this trial said that the sentence, which some consider stiff, was unrelated to Simpson’s 1995 acquittal in the murder of his ex-wife Nicole Brown Simpson and her friend Ronald Goldman. Text and photographs copyright 2011 by Esther Hecht. No portion of this text or photographs may be reproduced in any form without the express permission of Esther Hecht. Hostess-apron curtains: an unusual design element at Bella's Espresso House. The word “Espresso” on the café’s sign caught my eye when we turned off Intestate 80 at Wells for lunch. My husband loves good coffee, and the name, Bella’s Espresso House, suggested it would be a nice change from Denny’s. Our friendly waitress, who turned out to be the proprietor, assured us that everything is homemade. That sounded encouraging (though the food turned out to be very middling). Meanwhile, I noticed an unusual, homey, element of the décor. The entire upper row of curtains was made up of vintage hostess aprons. “Some are my mother’s, some are my grandmother’s, and some came from yard sales,” the proprietor told us. While we waited for the food, I got up to examine another element of the décor, an enlarged newspaper article in a massive gilt frame. The article, which appeared in a local paper in 2002, was about two brothels (they’re legal in Nevada) and how they turned a buck from the 2002 Olympics in Salt Lake City, 160 miles away. The madam of one of them, Bella’s Hacienda Ranch, said she drew about 100 extra customers by providing limousine service to her establishment. As I was paying for our food, I asked the proprietor whether she was the Bella of Bella’s Espresso’s House. “Oh no,” she said. “Bella’s my mother. She opened this place eight years ago.” The daughter said her name was Shaunia. Is her mother the same Bella mentioned in the newspaper article? “Yes,” Shaunia said. I couldn’t help wondering whether the nice couple I had photographed with the curtains was aware of the connection between the two establishments. An Internet search for Bella’s Hacienda Ranch (which, by the way, the newspaper article described as looking nothing like its name but rather like a truck-stop motel) turned up the information that the business, which has existed since 1950, is for sale. You could be the next madam of Bella’s. Text and photograph copyright 2011 by Esther Hecht. No portion of this text or photograph may be reproduced in any form without the express permission of Esther Hecht. It's white, it's crunchy; bring on the skis! The highway west from Salt Lake City to Wendover feels like the road to eternity. Sure, you get a glimpse of the Great Salt Lake and a lot more of the great salt flats. But the ruler-straight interstate leaves you wishing for some diversion, and there’s no relief until the change in terrain at the Nevada line. That weird sign makes sense when we spy travelers walking gingerly on the salt, bending down to taste it, and posing for souvenir pictures. From a distance, the salt looks exactly like snow, and the travelers would look a lot more like a part of the scene if they had cross-country skis. At Wendover you begin the ascent on the Toana Range through the Silver Zone Pass. The terrain becomes greener, though the trees appear to be juniper pine and too short to provide dependable shade for humans. As we approach Wells―where pioneers following the Humboldt Trail stopped to regroup―we see real snow, last year’s leftovers, on the surrounding peaks. And Wells, well, it’s a very small town with a very big surprise. Read about it in the next post. Cedar Breaks National Monument: All we had to do was to step out of our car. As America marked the tenth anniversary of the 9/11 attacks and as the symphony of memory reached a crescendo, my husband and I were driving into the land of Zion. We were on our way from Phoenix to Salt Lake City, passing the national parks we love most and have visited many times: Zion, Bryce, and Grand Canyon. This time, sadly, we were on too tight a schedule to stop. But there was one opportunity to let our spirits soar. We were traveling north on Highway 89, which passes the Grand Canyon and continues north between Zion and Bryce. Before we reached the entrance to Bryce, we turned west on scenic route 14 toward Cedar City. Halfway across the mountains we turned north again, heading toward Parowan. That road on top of the world (the summit of Brian Head is 11,307 feet high) passes through Cedar Breaks National Monument. The visitor center is open only June through October; for most of the rest of the year the road is covered with snow and impassable. 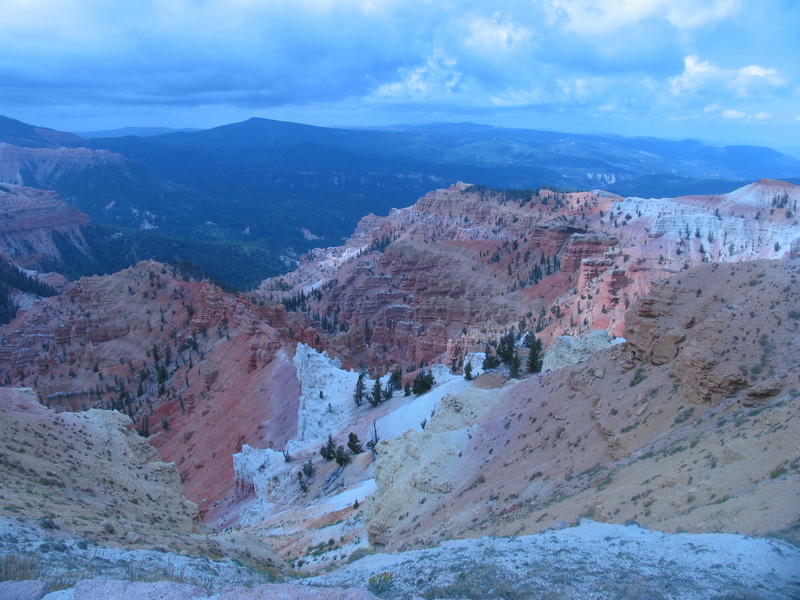 Cedar Breaks, a treasure we had never seen before, is a giant amphitheater 3 miles wide and more than 2,000 feet deep, with brilliant oranges and yellows and spire-like formations, as in Bryce. All we had to do was step out of our car and this glorious natural palette was spread before us. As we drove over towering mountains and through fertile mountains, we heard on the radio the many expressions of love of the country and appreciation of its freedoms. For us, that freedom was manifested in the vastness of the continent and the magnificence of its natural wonders. We felt so privileged to be able to travel again through the land of Zion. The Lone Ranger surprised us at the restaurant across from the motel. Kanab, the first town in Utah you encounter on your way north from Phoenix on Highway 89, is the gateway to Zion National Park, Bryce National Park, the Grand Canyon, and many other natural wonders. But Kanab (pronounced Kuh-NAB) has another distinction. It was here that the Lone Ranger called “Hiyo, Silver” and rode off into the sunset. The area around Kanab and Fredonia (the town to its south on the Arizona side of the line) has been the location for dozens of movies, mainly westerns (56 to be precise), and many television programs. It is said that more westerns and television programs have been filmed in this area than in any other single location outside of Hollywood. It had been a beautiful but long drive from Phoenix, and my husband pulled in to the first motel we saw, the Sun’N’Sand. It looked as though it was built in the 1950s and hadn’t been remodeled since. But it had everything we needed, including a round-the-clock supply of coffee and donuts, and the proprietor was very welcoming. When we asked for a restaurant recommendation, he sent us across the street to a place called Nedra’s Too. He promised we would get a discount if we mentioned his hotel (in fact, they give a 10 percent discount to anyone who is staying in the town). We expected a diner on about the same level as the motel, but we were in for a surprise. The place had rustic charm and the walls were covered with autographed photos of movie stars (most of whom I had never heard of but had probably seen on screen). From the menu we learned that the original Nedra, the granddaughter of a Mormon pioneer, was born in Kanab in 1917. She opened a café in Fredonia in 1957, serving American food every day but one, when she served her own style of Mexican cuisine. Her clients persuaded her to cook Mexican all week. The café became a favorite stop for movie crews and stars, including James Garner, Vera Miles, Sidney Poitier, and Clint Eastwood. The late Sen. Barry Goldwater used to have gallons of Nedra’s special hot sauce flown to his Arizona ranch, the menu said. 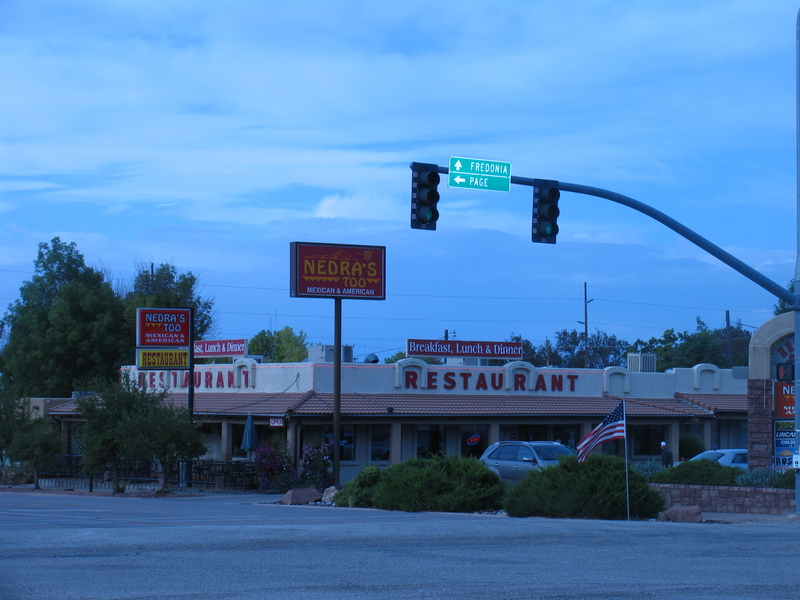 In 1990, Nedra’s Too opened in Kanab and is today operated by the original Nedra’s daughter, Nedra Pauline. The food is a cut above Mexican-style diners; the veggie quesadilla with spinach was excellent. And visitors can wax nostalgic about such classic westerns as Buffalo Bill (1944), sci-fi films like The Planet of the Apes (1968) and the 1999 Planet of the Apes, and TV series such as Gunsmoke, Wagon Train, and Daniel Boone. Yuma is the town near the California-Arizona border where aliens abducted my husband’s hat, almost exactly a year ago. The hat has not been the same since. This year something even stranger happened. We pulled into Yuma for a lunch stop on our way from San Diego to Phoenix, and shortly after we left, Yumans lost their electrical power. I would have accused the aliens for this event too, except that the outage spread back to San Diego, where we had just been, and ahead to Arizona, where we were headed. Must have been something we ate. Speaking of what we ate: We had lunch at Denny’s, which serves impossibly large portions. This time I decided to beat the system (both calorie-wise and money-wise) by splitting one order with my husband. What I chose, however, was something they call a make-your-own slam. For $6 you may choose four items from a list. So I chose two short stacks of whole-wheat pancakes (each pancake turned out to be the size of a large plate), a bowl of cereal (it was delicious but huge) with milk and brown sugar, and two fried eggs. That could easily have fed a family of four. Next time I’ll bring along some more people (or aliens) to share it with. “The cheese is kasher,” the young waiter said, using the Hebrew pronunciation, as I took my time choosing from the breakfast buffet at the Days Hotel in Hounslow. The waiter, whose nametag bore the unfamiliar moniker Inteaze, proceeded to inform me that kasher food and food for Muslims is essentially the same. My husband and I were in Hounslow because we prefer to break up the long flight from Israel to California with an overnight stay. But because the layover was too short for us to see anything in London, there was no point in going all the way into the city. So I chose this hotel, which is a bargain at under $90 per night (not including breakfast) and is only a few stops on the Underground from Heathrow. Inteaze (In-tee-AAZ), it turned out, is from Mauritius, and he knew of the existence of the Jewish cemetery there, a fact he found puzzling because almost no Jews remain on the island. There had been a Jewish community there for a brief period, I explained. Some 1,600 Jews who were trying to escape Nazi Europe by coming to Palestine in 1940 were refused entry by the British and detained in Mauritius, where 128 of them died of tropical diseases and harsh conditions and were buried in the St. Martins Jewish Cemetery. In August 1945 the British allowed the remainder to return to Palestine. A few dozen still live on the island. The friendly waiter said he’d learned about kosher food while working at a Club Med resort in Eilat some years before. Another thing he’d learned there was that Jews don’t cook from sundown on Friday until Saturday night, and he knew the greeting “Shabbat shalom” (Sabbath peace). When he came to our table to pour our tea, he smilingly tried to explain the relationship between Islam and Judaism. “But they made a mistake,” my husband interjected. That was one mistake I had never heard of; I’ll have to look it up. And so we finished our tea, wished each other well, took our mistakes, and headed back to Heathrow. Text copyright 2011 by Esther Hecht. No portion of this text may be reproduced without the express permission of Esther Hecht. What would you do for peace? Esther Hecht's blog copyright 2009-2013. No part of this blog may be reproduced without written and express permission of the author.